A strange time to visit Ukraine but I don’t get that many invites and its so much more exciting to say you’re a Flying Winemaker rather than a Driving Winemaker . Ivan Planchkov owner of The Kolonist Winery (about 200 km west of Odessa towards the Romanian border) extended the invite to celebrate the Balkan vine pruning holiday and celebration Trifon Zarezan held on the 15th of February . Traditionally this is the first day that vines can be pruned. (English growers take note) . The promise was of Priests,feasts , wine and dancing. 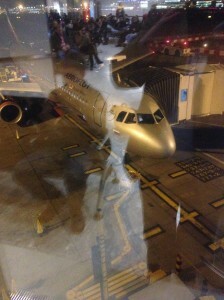 I flew overnight via Moscow . Congratulations to Cafe Rouge at Heathrow for the worst and most expensive food and drink experience of the trip , stale chips and what was alleged to be Gamay but tasted like it had been to Odessa and back by steamer , open and on the top deck. I was expecting cold and snow, it was warmer than England and it wasn’t raining. Apparently there had been 2 metres the week before.From Odessa it was a 4 hour drive , mile upon mile of flat black plain, no houses ,no people ,.Maize for Bio -fuel , sunflowers are the main crops .Small trees with their trunks painted white line the pot holed road, not for night time safety but as an insectide. Wild-life is restricted to crows,buzzards and Amy Whitehouse on the radio, the sight of a pheasant caused much excitement . I arrived in time for a tasting of the 2013 harvest tanks and bottled samples from previous vintages with the Kolonist team and Olivier Dauga a French consultant about to launch his own line in consultant winemakers clothing. The Kolonist is an ambitious project.The back label shows a map of the 45 th parallel which of course runs through Bordeaux and rather surprisingly Krinichnoye. Temperatures in this area of Ukraine tend to be rather more extreme , down to -30ºC in the winter and 50°C in the summer. Summers can be very dry with no rain for 2 months.The majority of the wines are red, Cabernet Sauvignon ,Merlot and a couple of local reds Odessa Black and Karmarut. Chardonnay , Muscat and Riesling also grown.Their best wines are really very good and expensive (the best wines in the Ukraine) and they have shared an award for best wine with Nyetimber . If you do come across them the Merlot 2012 Kolonist and the Cabernet Sauvignon 2012 are the pick of the newer wines.The Cabernet /Merlot 2008 is a top wine but now only in the collection. A medium sweet riesling is made for the ladies, together with some fortified wines. Following the tasting it was time for the celebrations and blessings to take place . Sommeliers, journalists and the head of Ukranian wine arrived on mass by coach together with the Priest and Bulgarian/Ukrainian folk dancers and I suspect a rather well known Folk singer. 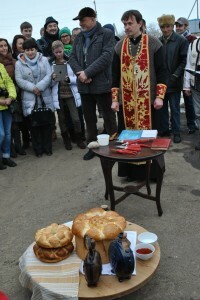 Prayers were said, the bread, oil, vines and participants were splashed with Holy Water, the first wines were pruned. everyone joined in . The oil was used to annoint the pruning wounds, bread dipped in the red paprika was eaten. Then it was time to dance. Food and Drink. Hot wine with Honey and pumpkin pastries . 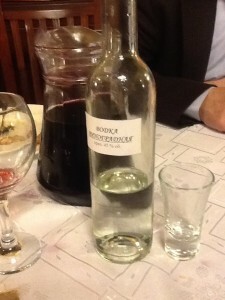 More food and wine and delicious local vodka. A big thank you to my generous host Ivan and the best of of luck to all who looked after me , drove me around, translated , and of course made the wine. 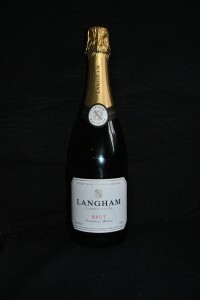 The surprise winner of the Parsons Nose tasting was Langhams 2010 classic cuveé. I can claim little credit for it but I like to think that my advice has contributed .